J.F.W. DesBarres, British Army artillery officer and surveyor, oversaw the surveying and publication of the best set of charts of the American coast until the early to mid 1800s. The set was known as the Atlantic Neptune. They were useful to the British during the American Revolution. See DesBarres biography in the Dictionary of Canadian Biography. 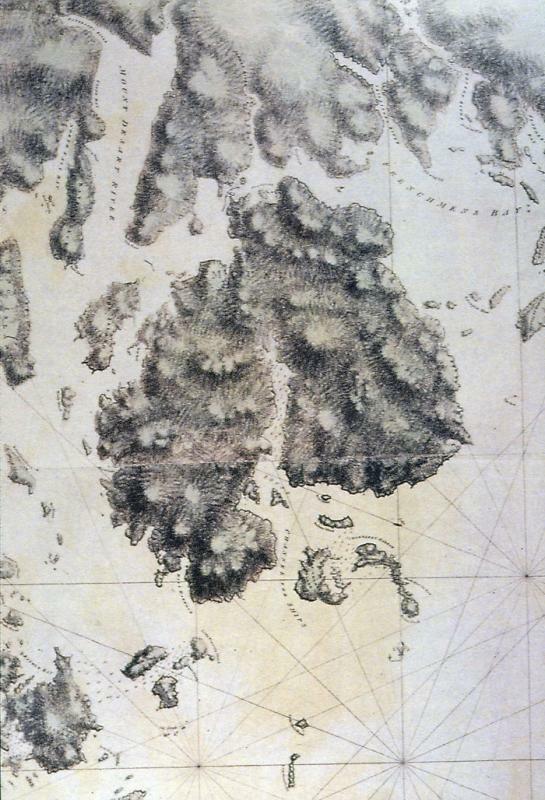 The Gulf of Maine is shown in this part of a much larger chart, Gulf and River St. Lawrence, including the Coast from Breton Island to Cape Cod and the Island & Banks of Newfoundland. The chart was published by the well-known chart maker James Imray of London in 1853. 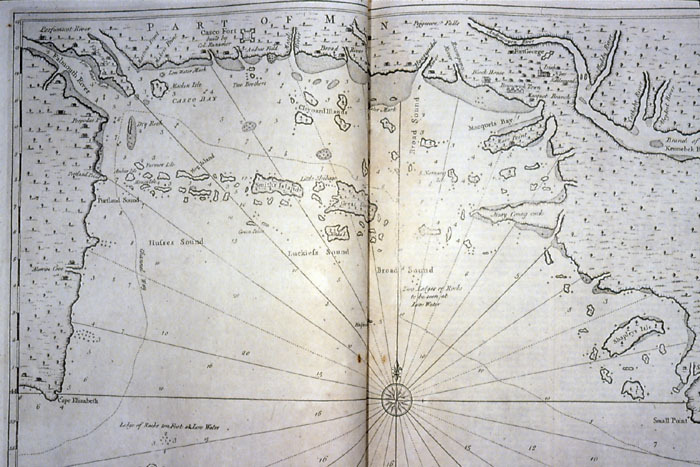 By today's standards these charts have nowhere near the detail that we are accustomed to on our harbor and near coast charts, but they did serve to plan voyages and plot positions of the ship at sea. 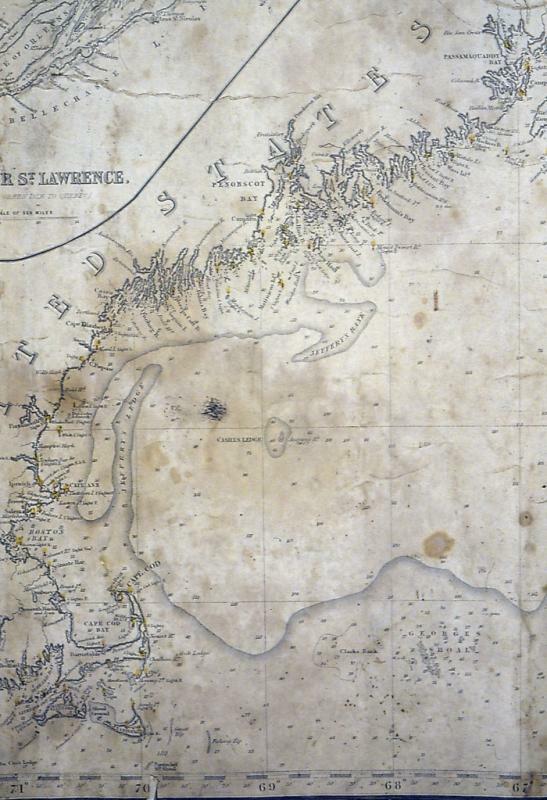 Detail of chart, The North Eastern Coast of North America, from New York to Cape Canso, including Sable Island, by Edmund Blunt, 1847. 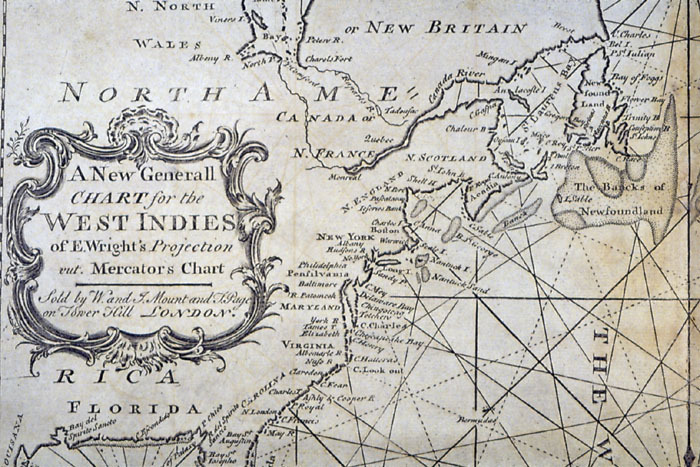 Though the title of the chart is "A New Generall Chart for the West Indies," it shows the East Coast of North America as far as Newfoundland and the Grand Banks. The West Indies were by far the most important economic asset of the British during the colonial era. This is part of The English Pilot, Fourth Book, published in 1767. 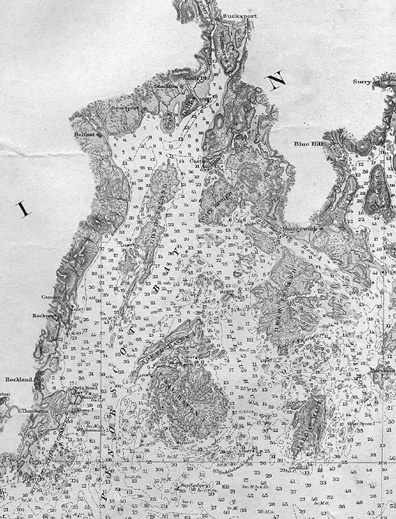 Detail of the Penobscot Bay Maine nautical chart, 1/40,000 scale. Note how the chart not only shows depths and navigational features, but it shows much information on land, including buildings, topography, locations of stone walls, and even where there are and aren't trees. 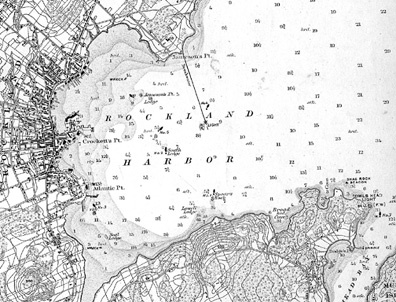 By 1876, the Rockland breakwater was protecting the great number of vessels coming and going in pursuit of the lime trade. 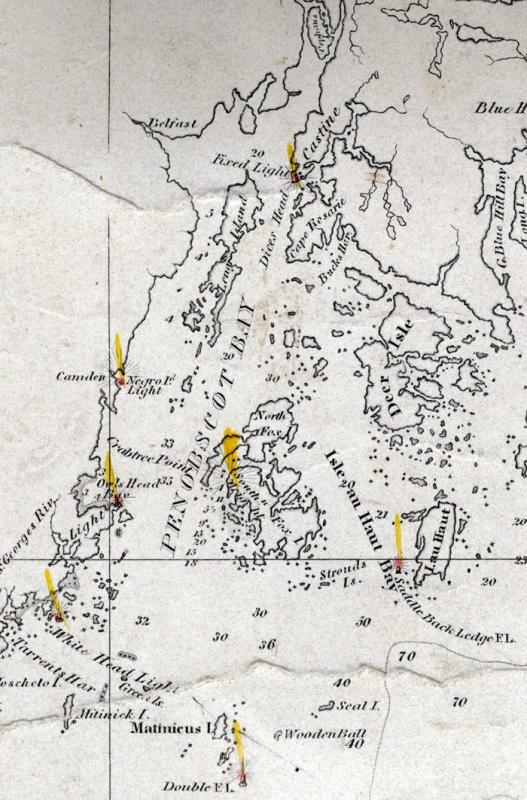 Very little of the Maine coast was charted well before the late 1700s. This chart shows the only part of the coast that did get charted in detail. Casco Bay was important for British shipping, because Falmouth, the predecessor to Portland, was an important center of the mast trade. This is from a later edition of The English Pilot, Fourth Book, published in 1767. 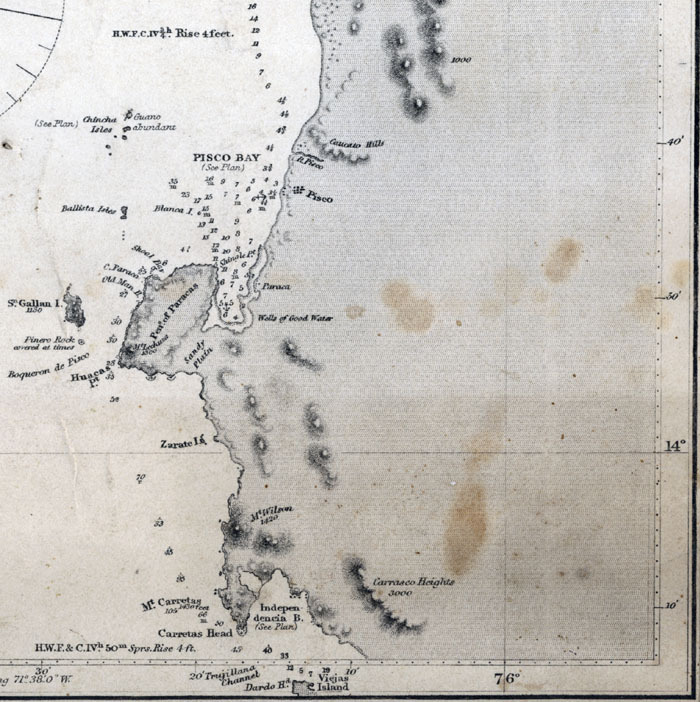 This is a detail of a nautical chart of the west coast of South America, "Peru: Independencia Bay to Begueta Bay." Though published in 1864, the original date of publication was 1836, and it was surveyed by Capt. Robert Fitz Roy, who was captain of the Royal Navy ship Beagle on which Charles Darwin sailed. The detail shows where the Chincha Islands are, off the coast of Peru and outside of Pisco Bay. They are about 120 miles south-southeast of Lima. The Chincha Islands had tremendous deposits of seabird guano, which was mined for fertilizer. 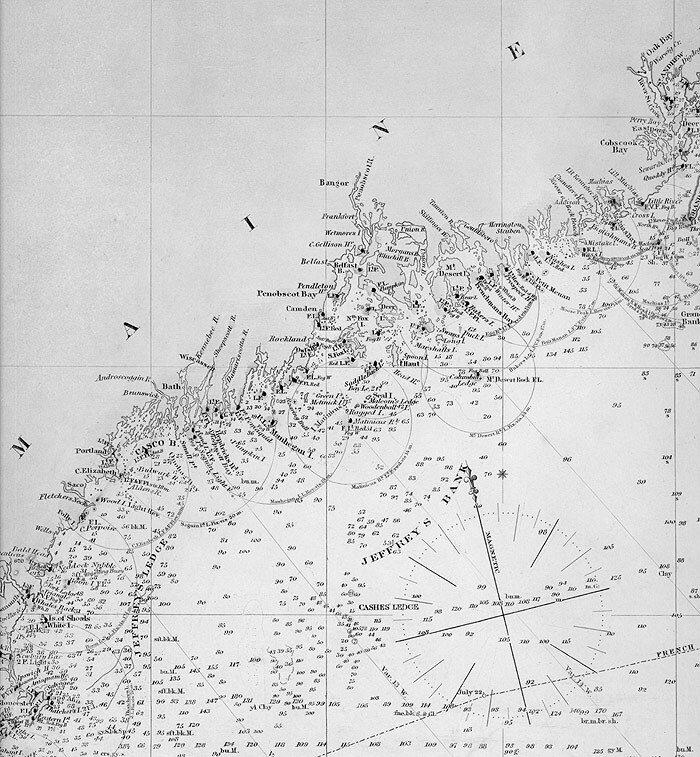 This is a detail of a nautical chart of the west coast of South America, "Peru: Independencia Bay to Begueta Bay." Though published in 1864, the inset is dated 1858, when the guano trade was growing very fast. The guano "shoots" shown on the North Island are chutes down which guano could be poured. 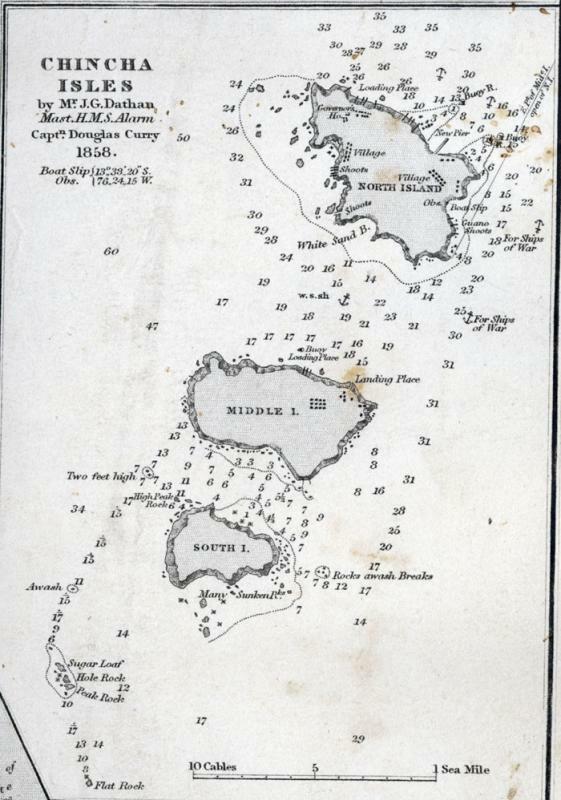 This chart, dating to the mid 19th century, shows some of the popular fishing banks in the upper Gulf of Maine and off the coast of Maine, including Jeffrey's Ledge, Jeffrey's Bank, and Cashes' Ledge. The lighthouses and their ranges are clearly marked.